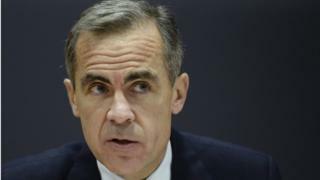 The governor of the Bank of England has ruled out an immediate rise in interest rates because of the turmoil in the global economy and weaker UK growth. In a gloomy assessment of the state of the world, Mark Carney said that collapsing oil prices and an "unforgiving" global environment meant that tighter monetary policy was not yet necessary. Mr Carney's assessment comes six months after he suggested that a rise in interest rates would come into "sharper relief" at the beginning of 2016. Many assessed that as a signal that rates would start rising early this year - a relief for savers who have struggled with historically low interest rates since the financial crisis. Rate rises now seem a more remote prospect, with many economists predicting no change in interest rates until the second half of the year or even into 2017 - despite Mr Carney warning as long ago as the 2014 Mansion House speech that rate rises might be approaching. That will come as good news for mortgage holders. "Last summer I said that a decision as to when to start raising Bank rate would likely come into sharper relief around the turn of the year," Mr Carney said in a speech at Queen Mary University of London. "Well, the year has turned and, in my view, the decision proved straightforward - now is not the time to raise interest rates." He said that volatility in China - which earlier today announced its lowest growth rate for 25 years - as well as a collapse in oil prices and sluggish pay growth in the UK meant that any rate rise could be delayed. The governor said that any increases in the future would be small and gradual. "It is clear to me that since last summer, progress has been insufficient to warrant a tightening of monetary policy," Mr Carney said. Mr Carney said he would not be driven by the "calendar" on when to raise rates but on "economic prospects". "We'll do the right thing at the right time," he argued. Late last year, many believed that pressure on the Bank of England's Monetary Policy Committee to raise rates would increase after Janet Yellen, the chairwoman of the American Federal Reserve (the US central bank), announced a small increase in rates, the first since the financial crisis. Mr Carney dismissed those suggestions, saying that "cost pressures" - inflation - was stronger in the US and the British economy was more exposed to the global slowdown in growth. He also pointed out that the Fed's rate rise had only brought the US interest rate to the same "lofty level" as the Bank of England's. The Governor said that three factors would be the strongest guide to when interest rates might rise. First, that economic growth in the UK would be higher than the average trend. He said that growth at an average quarterly rate of 0.5% in 2015 had "disappointed". Second, that wage growth strengthens and productivity improves. And, third, that core inflation starts to approach the target rate of 2%. "These three factors I have described are guides for monetary policy decisions, but there are no magic thresholds," Mr Carney warned. "The journey doesn't have a set timetable; only an expected direction of travel.